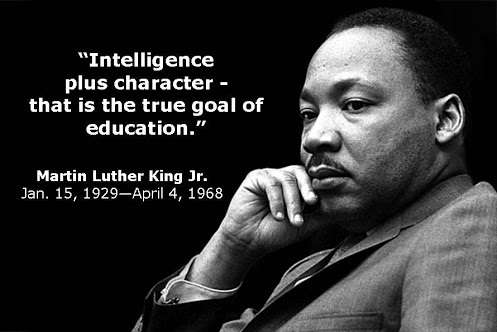 6 Responses to Remembering Dr. Martin Luther King, Jr. I am VERY impressed by the many young people who spent the holiday protesting against the “civil rights old guard” and the corporate interests who have corrupted Dr. King’s messages. In Atlanta — where the holiday has long been a big but generally mellow and celebratory affair — a showdown occurred between the civil rights old guard and the new, more boisterous generation of protesters, many of whom were catalyzed to action by the deaths of Michael Brown in Ferguson, Mo., and Eric Garner in Staten Island, both at the hands of the police. The protesters argued that the holiday had become corrupted by corporate involvement, diluting Dr. King’s ideas about economics as well as race. With signs, slogans and shouts, they inserted themselves into the annual parade as it made its way down Peachtree Street, Atlanta’s downtown thoroughfare. Several times, the group sat and lay en masse in the middle of the street, raising fists toward the air as the police pleaded with the protesters to move on. K. Renee Robertson of the Southern Christian Leadership Conference said afterward that she thought the insurgents’ passion was “great.” “But do it in the right way,” Ms. Robertson said. In reality, the breakdown of the family unit among African-Americans in the U.S. [for a whole host of reasons] is mostly to blame. So many young men and boys have been or are being raised by second or third generation single mothers and are missing key lessons in the importance of fatherhood. This is a whole different issue – it’s economics and access, not necessarily race as there are many more families in the U.S. in the same situation. Parenting should be taken much more seriously, right from conception. We are in a quagmire of public policy on the issue, as we continue to reward women for having more children, but those children suffer the ills of poverty throughout their lives – a poverty that has become nearly impossible to escape, as the middle class dwindles. Education is key. We have the money necessary to lift young people out of poverty through education. We have the ability to teach trades, economics and family planning. We have the ability to enlighten young people as to how to forge a healthy, successful life and to be true to your own family as your highest order. These notions used to be taught in American schools, however, political correctness has put an end to it. In reality, what we refer to as ‘political correctness’ is only good for politicians – and is terrible for those it pretends to protect. Take a look around – successful children – regardless of race – by and large have family support in every aspect of their lives. Every day. Parenting is a job. Parenting skills and the value of family (rather than money) can and should be taught to children in school. Waiting until they are adults and their own children are already in school is far too late. FREE SELMA TICKETS FOR STUDENTS! For 7th, 8th and 9th graders only. Students can show their student ID or report card at the box office of any participating theater in Atlanta, to receive their free ticket (while tickets last). For more information, please visit THIS link. As a black woman, raised by a single black woman, I find Another Comment’s comment offensive. I like this blog because it supports the betterment of Dekalb students without politics getting in the way. I think it’s best to keep your personal opinions on what’s best for the black community to yourselves. I could write a dissertation on how the legacy of slavery and then Jim Crow and then drugs implanted into our community has weakened us as a whole. But I don’t have the time, and don’t think you’d be open to listening anyway.